Look, zebras. Are they male or female? That’s easy. You can tell the males because they are black with white stripes. The females are white with black stripes. 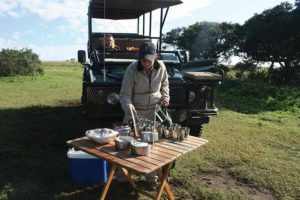 Our safari hostess Dianne O’Donnell has told the zebra joke many times before but in the dancing sunlight of the early morning game drive it is the most uproarious thing we have heard. The next thing she said made eminent sense. Zebra black absorbs the heat and white reflects it. When her telephone ringtone goes off it fits right in to the crazy collision of technology and pretend untamed bush, a Bok Makirie call from her cell phone. You don’t need to be lucky on your game drives through most of South Africa. There is a fence to hold the animals in. You are on a game drive in a pen, something like Disney’s Serengeti Plains in Orlando, more Dr Doolittle than Dr Livingstone. I have to admit I was sceptical about private game reserves but here in Amakhala I am beginning to get it. When you come to a private reserve you see the animals more easily. Not everyone has the days to wait for the safari sighting. The Serengeti it ain’t, but time is precious. As if to prove him wrong, we tell him we prefer the dark, because Bill’s stories are long and from another era, as he regales us in the little bar he has built in the former barn of his 18th century Netherlander’s farm. The red wine is flowing and the stories get better. Outside there are the sounds of the bush, that epic cicada chorus and cacophony of feline coughs and roars, because Bill has abandoned sheep and cattle to bring his farm back to its natural state and open a private game reserve. We are in the Eastern Cape, working our way from East London to Port Elizabeth. There are strategic game stops and viewing points along the way, the largest bay in Africa, Algoa Bay and Addo Elephant Park amongst them. The heat wasn’t on during our particular visit, thankfully. The park is 208 square miles, two thirds the size of County Louth and four times the size of Achill. The red earth wonder and the lush green make it a worthwhile diversion on the road. 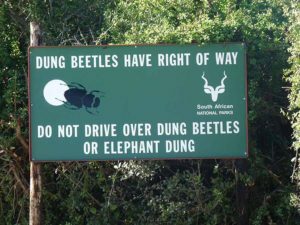 Dung Beatles have the right of way, the sign says. Poo being pushed around is as big an attraction here as the elephants. As stadium wildlife experiences go, you cannot beat the pooh-pushing. In the evening the local lions are easily picked out in the headlights. “The lion is probably in the bushes laughing at the black man driving the white people around,” driver Noni Caga declares. At Prana Lodge, they are just a climb over a dune away from seven kilometres of unspoilt and warm Indian Ocean Beach. Words do not describe how beautiful this place is. Game is not really what the Eastern Cape does best, although it doesn’t stop them trying. Beaches are. The beaches are largely ignored and unspoilt and catch the most amazing breezes. The surf school run by Jon Ginenge is based on a beautiful beach, and my instructor, Sean Pooley, endlessly patient. “It’s all about the front foot he says,” but it isn’t. The attempt at surfing takes place not far from where there was a documented shark attack. So they told us, but the sharks were scarce, probably guffawing at our efforts form a safe distance. The most dangerous animal in the water is a human being with a ski boat and beers, another of the team Les Kingma intervenes. The sandy coast is a surfing haven, when the mood alternates between the beastly easterlies and the besterly westerlies, as Dean Knox describes them. The canoe ride up the Nantoot river restores some semblance of dignity. “Don’t worry about the crocodiles” says Jon. “They left because of the sharks. But their numbers are gone down because of the anacondas.” Funny guy. 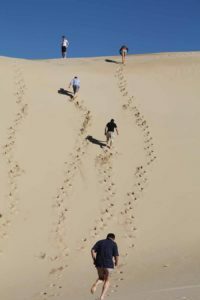 Further on the coast we do the Addo river cruise and finish by tearing up the second largest dunefield in Africa. The sand is exhausting, and ever changing, like so much of this continent. Even if you wanted to, you could not escape the darkness stalking the land for long, and the local tourist lodges encourage visitors to embrace the terrible sadness of a HIV orphanage in Paterson. You come from these places and weep at the terrible plague that is clouding over Africa. It is one reason why our holiday euro is better spent on the forgotten continent than in Vegas or Tenerife. Even if you don’t seek the sadness, which nobody wants to do on holidays, spending money here is going to help in its own small way. 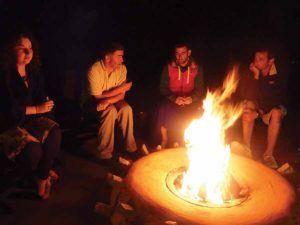 They lit a large campfire at Safari Lodge to fuel our imagination. The music in the background was Nomvula by Freshly Ground (After the Rain) and Vusi Mahaseoa’s elaborate guitar work. It haunted and tamed the night, but we knew the cicada chorus was still out there. Some aspects of Africa can never be tamed, however. When you put your head on the pillow at night in your pretend tent with the en suite bathroom, THAT sound permeates everything, the distinctive call of the bush, the tiny cicada, its song dominant over every great cat or giant jungle beast, the fiery necked night jar music bouncing and echoing through the valley. And the animals that join in can be picked out one by one. Amongst those you had the spotted thick knee. As dawn got closer you heard the cape robin chat, hewglin’s robin. Then we had the southern bou bou shrik. Then we had bar throated aplis. Then we had the terrestrial bulbul. And the day was renewed, the Southern Cross gone away and the African Sun about to show its face once more.